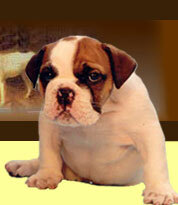 With his wrinkled face and sweet look, the bulldog has always been a challenge to artists. Nearly every art form has reproduced this breed. 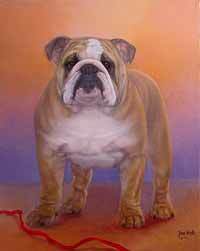 The Bulldog is undeniably one of the most documented of all dog breeds appearing under various guises, in drawings and paintings going back several centuries. The essence of the bulldog personality was also captured in sculptures, carvings, etchings, art photographs and figurines. 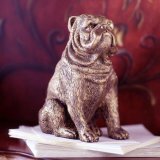 Besides in the most valuable collectibles in the hands of private collectors and museums, the Bulldog also appears in contemporary and everyday objects, like decor objects, gift ideas, furniture, bulldog stamps, and bulldog fashion wear. Numerous Bulldog "aficionados" all over the world share the passion for collecting bulldog objects. After numerous e-mail requests for information about Bulldog Memorabilia and gift ideas, we have decided to put up these pages with a selection of objects bearing the effigy of your preferred breed. Click on one of the pictures below to access the page with the corresponding selection of bulldog products. We hope you'll enjoy visiting these pages !